Russian President Vladimir Putin, left, shakes hands with U.S. National security adviser John Bolton during their meeting in the Kremlin in Moscow, Russia, June 27, 2018. The summit confirmation by both sides came a day after Trump's National Security Advisor John Bolton met with top Russian officials, including Putin, to lay the groundwork for the summit. "President Trump asked me to come and speak to Russian authorities about the possibility of a meeting between him and President Putin," said Bolton, speaking at a press briefing with international journalists in Moscow on Wednesday. 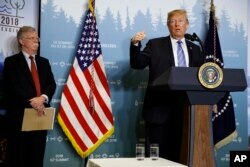 National Security Adviser John Bolton looks on as President Donald Trump speaks during a news conference at the G-7 summit, June 9, 2018, in La Malbaie, Quebec, Canada. Bolton, who last year called Russian election interference “a true act of war,” seemed to comply with the Trump administration Wednesday, at least as far as any possible collusion between the president's 2016 campaign and Russian operatives. "I think Putin so far has been willing to accept Ukraine as another frozen conflict. I think there’s efforts afoot to try to find a way back to the Minsk agreement and to find a solution to the Ukrainian issue," Manning said. "And it’s always easier to get into an intervention to get out of it, and I think probably Putin’s looking for an exit strategy in Syria as well."